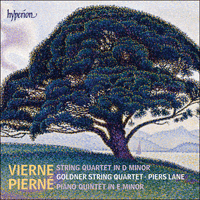 The admired Goldner String Quartet presents two utterly charming—yet little-known—examples of French chamber music by contemporaneous composers Pierné and Vierne. Pierné’s fame came from his conducting, and his compositions are forgotten today. His Piano Quintet shows the influences of Massenet and Franck which characterize his music, and features the Basque dance ‘zortzico’. Vierne was a celebrated organist, and his compositions for organ are heard every Sunday wherever there are suitable instruments and performers. 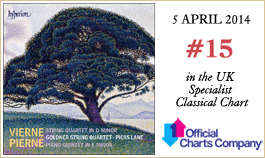 His String Quartet shows a lighter side: it contains the Intermezzo, described by Roger Nichols as ‘quite simply one of the most delicious movements in all French chamber music. Over it hovers the spirit of Berlioz’s ‘Queen Mab Scherzo’ and of Mendelssohn’s Midsummer Night’s Dream, conjured up by pizzicatos, tremolos and dancing phrases that suddenly turn on a centime piece from one key to another’. Henri Constant Gabriel Pierné was born in Metz in Lorraine in 1863. His father was a professor at the Metz Conservatoire and his mother came from the other end of France, in Montpellier (from her, one biographer has opined, Gabriel inherited ‘a certain vivacity’). Wisely, as it turned out, his parents moved from Metz to Paris to escape the Franco-Prussian War, and the eight-year-old Gabriel entered the Paris Conservatoire in 1871, where he was taught by Massenet and César Franck. A grand haul of first prizes duly followed, in piano, counterpoint and organ, culminating in the Prix de Rome in 1882. On Franck’s death in 1890, Pierné took his place as organist at Sainte-Clotilde until 1898. But the decisive post was that of assistant conductor of the Colonne Orchestra which he assumed in 1903, from which he graduated to chief conductor on the death of Édouard Colonne in 1910. He remained in the post until 1934. All this contributes to what one might call ‘a solid musical career’, with the implied parallel that maybe such solid musicians are unlikely to be particularly creative. One contra-indication in Pierné’s case comes in some of the premieres he was asked to conduct: of Stravinsky’s aforementioned Firebird in 1910, of part of Ravel’s Daphnis et Chloé in 1911, and of Jeux in 1913—all calling for a conducting technique, certainly, but also a generous helping of vivacity and imagination. His chamber music, making up about a quarter of his total output, belongs to two distinct periods: 1882–1900 and 1916–1936. The first of these ended with his Violin Sonata, dedicated to Jacques Thibaud with whom he often played it. The Piano Quintet in E minor began the second period, and was premiered at the Société nationale on 22 February 1919 with the composer at the keyboard. The work is dedicated to Gabriel Fauré. In general, the twin influences of Massenet and Franck combine happily in Pierné’s music, the grace and melodic ease of the former being given substance by the contrapuntal tendencies of the latter. But the opening of this Quintet owes nothing to either of them. Instead, an insistently rotating four-note ostinato looks forward to the 1920s when such ostinatos became all the rage, not least under the influence of Stravinsky. Over this repeated figure floats a curious iambic rhythm, imparting if anything a sense of loss or nostalgia, as in Debussy’s Prélude Des pas sur la neige. Certainly this opening is nothing like the ‘solid’ start one expects from a forty-minute chamber work. But suddenly, impelled by Franckian piano chords, the music takes wing in a climax on octave strings, before receding again. The central theme of the movement is built more on rhythm than anything, with a triplet followed by dotted notes. For much of the time all five instruments are playing, until the four-note ostinato returns, and then the iambic tag, as the music finally sinks to rest. Pierné had already experimented in 1910 with the Basque dance the ‘zortzico’ in his incidental music to Pierre Loti’s play Ramuntcho about Basque smugglers (Pierné’s conducting of the overture, available on YouTube, gives some idea of his tight rhythmic control). The dance has five beats in a bar, involving dotted rhythms (tum-tum-ti-tum-ti), and Ravel had used a version of it, with three beats added on the end, in the first movement of his Piano Trio of 1915. Pierné begins by alternating the 5/8 of the zortzico with standard 4/8 bars, as though breaking us in gently. But the zortzico tune, when it does come, is a delightful exercise in the popular vein—maybe even an original Basque tune, though no one has identified it as yet. Mostly the movement consists of variations on this tune in different keys and with different harmonies, but a secondary idea does emerge in the shape of a rising scale, complementing the falling pattern of the zortzico. Finally Pierné combines the two in the unusual metre of 20/8, before the music once more sinks to rest, in a long haze of D flat major. In the slow introduction to the finale, Pierné tips his hat respectfully to Franck by revisiting tunes and rhythms from the previous two movements, starting with that of the zortzico. With increasing contrapuntal complexity comes an increase in speed, until the dam breaks—or if you prefer, the clouds disperse and a sunny E major tune emerges, Allegro vivo ed agitato. Franckian modulations carry all before them, culminating in a new theme (though again based on dotted rhythms) accompanied by trumpet-like chords on the piano. From here, all is development, interrupted by a couple of relatively peaceful oases. Dotted rhyhms continue to predominate, though the height of complexity is reached when the zortzico’s 5/8 is combined with both a 4/8 and a 3/8. The race to the end is exhilarating and triumphant. If conducting was Pierné’s ‘success obstacle’, for Vierne it was organ playing: in 1900, at the age of twenty-nine, he was appointed organist of Notre-Dame by a unanimous vote, which, in a world where everyone held rigorously to their own views as to what constituted good organ playing, spoke volumes. Born in Poitiers in 1870, he was nearly blind due to congenital cataracts and it was at an institution for blind students that he came under the wing of César Franck. In 1890, the year of Franck’s death, he entered Widor’s organ class at the Paris Conservatoire and won his first prize in 1894. Much of the Quartet reveals that, even at the age of twenty-four, Vierne’s approach was spiritual after the manner of Franck—if Vierne had heard the premiere of the Debussy Quartet in December 1893, there are few signs of it here. There is instead an economy of means that matches his organ playing which, according to Duruflé, was notable for its balance and ease, devoid of florid gesturing. The opening Lento is a good example: it makes its point through imitative entries à la Bach and Franckian chromaticism, but condensed into a mere seven bars that leave us wanting more. In the Allegro agitato that follows, the two main themes are presented clearly, the first abrupt, the second smooth (in the approved manner) and with a long note in the middle of each phrase, a Franckian fingerprint. After this the development treats both ideas sequentially, then interspersing the two. We should note too that the upside-down version of the first theme refers back to the slow introduction. There are no tricks in the recapitulation, the second theme now moved correctly from F major to the tonic D major, and Vierne contents himself with the briefest of codas. The Intermezzo is quite simply one of the most delicious movements in all French chamber music. Over it hovers the spirit of Berlioz’s ‘Queen Mab Scherzo’ and of Mendelssohn’s Midsummer Night’s Dream, conjured up by pizzicatos, tremolos and dancing phrases that suddenly turn on a centime piece from one key to another. It’s hard to imagine Vierne writing it, as he did, on outsized manuscript paper using, as his friend Marcel Dupré said, ‘a large pencil’. Again, he is determined not to outstay his welcome, and the ‘sign-off’ might sound perfunctory were it not so perfectly judged in both harmony and timing. The slow movement, in standard ternary form, again exploits the Franckian long note in the middle of the phrase, giving the main theme a yearning quality that we now hear almost for the first time. In the central section Vierne injects some urgency into the proceedings with a figure of four, fast repeated notes that is shared between all four instruments. The first section duly recurs and at first it seems as though we’re heading for another downplayed ending; but Vierne has a surprise in store in the shape of an eighteen-bar coda all over a low tonic A. It may last only 70 seconds, but in the context of the relatively abrupt endings of the previous two movements it’s a masterstroke. The finale follows the preceding pattern in containing two well contrasted themes, a brisk, stringy one in semiquavers, and a more lyrical one built around triplets and the ever-present long central note. All seems set for a standard rondo form, when the opening flourish returns—and we’re presented with a fugue. The relevance of this becomes clear when the countersubject, the figure that fits with the subject, turns out to be closely related to the movement’s stringy first theme. From here to the end, the main influence would seem to be that of Mendelssohn in academic rather than fairy mode (let it be said, there were many worse influences Vierne could have chosen …). Finally, D minor becomes D major according to the best traditions, providing a stirring conclusion to a work that throughout exhibits ‘the uncommon naturalness’ that so impressed Duruflé in Vierne’s organ playing. Henri Constant Gabriel Pierné naquit en 1863 à Metz; son père enseignait au Conservatoire et sa mère venait de l’autre bout de la France, de Montpellier (d’elle, dira un biographe, il hérita «une certaine vivacité»). Pleins de sagesse, tous deux fuirent la guerre franco-prussienne et s’installèrent à Paris; en 1871, à huit ans, Gabriel intégra le Conservatoire, où il eut pour professeurs Massenet et César Franck. Naturellement, il rafla une moisson de premiers prix (piano, contrepoint et orgue) avec, en apothéose, le prix de Rome en 1882. En 1890, Franck mourut et Pierné lui succéda à la tribune de Sainte-Clotilde, qu’il tint jusqu’en 1898. Mais le tournant de sa carrière s’opéra en 1903 quand il devint chef assistant de l’orchestre Colonne. Promu chef principal en 1910, à la mort d’Édouard Colonne, il le demeura jusqu’en 1934. Voilà qui contribue à vous asseoir une «solide carrière musicale» avec, en sous-entendu, l’idée qu’un musicien aussi «solide» n’est peut-être guère enclin à se montrer très créatif. Ce qui, chez Pierné, est démenti par certaines des premières qu’on lui demanda de diriger: L’Oiseau de feu (1910); des fragments de Daphnis et Chloé (1911) et Jeux (1913) de Ravel—toutes œuvres qui requièrent, il est vrai, une certaine technique de direction d’orchestre mais aussi une bonne dose de vivacité et d’imagination. La musique de chambre de Pierné (environ le quart de sa production) se répartit en deux périodes distinctes: 1882–1900 et 1916–1936. La première de ces périodes s’acheva sur la Sonate pour violon, que Pierné joua souvent avec Jacques Thibaud, à qui il la dédia. Inaugurant la seconde période, le Quintette avec piano en mi mineur (dédié à Gabriel Fauré) fut créé à la Société nationale le 22 février 1919, avec Pierné au clavier. En général, les influences de Massenet et de Franck se marient avec bonheur dans la musique de Pierné, la grâce et l’aisance mélodique du premier prenant corps au contact des propensions contrapuntiques du second. Pourtant, l’ouverture de ce Quintette-ci ne leur doit rien. Un ostinato de quatre notes, obstinément en rotation, regarde vers les années 1920, où ce genre de figures feront fureur, essentiellement sous l’influence de Stravinski. Au-dessus de cette figure répétée flotte un curieux rythme iambique, qui insuffle plutôt un sentiment de perte ou de nostalgie, comme dans Des pas sur la neige, le prélude de Debussy. Certes, cette ouverture n’a rien du «robuste» début qu’on pourrait attendre d’une œuvre de chambre de quarante minutes. Mais soudain, poussée par des accords pianistiques franckistes, la musique s’envole dans un apogée, sur des cordes en octaves, avant de redescendre. Le thème central du mouvement repose plus sur le rythme que sur autre chose, avec un triolet suivi de notes piquées. La plupart du temps, les cinq instruments jouent, jusqu’au retour de l’ostinato de quatres notes; survient ensuite le slogan iambique, quand la musique sombre dans le silence. En 1910, Pierné avait déjà expérimenté le «zortzico» dans la musique de scène qu’il avait signée pour Ramuntcho, la pièce de théâtre de Pierre Loti sur des contrebandiers basques. (Sur YouTube, on peut entendre Pierné en train de diriger l’ouverture, ce qui donne une idée de sa maîtrise rythmique serrée.) Cette danse basque a cinq temps par mesure, avec des rythmes pointés (tum-tum-ti-tum-ti), et Ravel en avait utilisé une version, avec trois temps ajoutés à la fin, dans le premier mouvement de son Trio avec piano (1915). Pierné commence en alternant le 5/8 du zortzico avec des mesures standard à 4/8, comme pour nous habituer en douceur. Mais quand il arrive vraiment, l’air du zortzico est un charmant exercice dans la veine populaire—peut-être même s’agit-il d’un air basque original, bien que personne ne l’ait encore identifié. L’essentiel du mouvement consiste en variations sur cet air, dans différentes tonalités et avec différentes harmonies, mais une idée secondaire émerge sous la forme d’une gamme ascendante, en complément du modèle descendant du zortzico. Enfin, Pierné combine les deux en un inhabituel 20/8, puis la musique retombe dans le silence, dans une longue brume de ré bémol majeur. Dans la lente introduction du finale, Pierné tire respectueusement son chapeau à Franck en revisitant des airs et des rythmes des deux mouvements antérieurs, à commencer par le zortzico. La complexité contrapuntique croissante s’accompagne d’une accélération de tempo, jusqu’à ce que le barrage cède—ou, si vous préférez, jusqu’à ce que les nuages se dissipent et qu’émerge un air ensoleillé, en mi majeur, Allegro vivo ed agitato. Des modulations franckistes triomphent et culminent dans un thème nouveau (mais toujours fondé sur des rythmes pointés), escorté d’accords pianistiques façon trompette. Dès lors, tout est développement, interrompu par deux havres relativement paisibles. Les rythmes pointés demeurent prédominants, quoique le summum de la complexité soit atteint quand le 5/8 du zortzico se combine à un 4/8 et à un 3/8. La course vers la conclusion est exaltante, triomphante. Si pour Pierné l’«obstacle du succès» fut la direction d’orchestre, pour Vierne, ce fut le jeu d’orgue: en 1900, ce jeune homme de vingt-neuf ans obtint la tribune de Notre-Dame à l’issue d’un vote à l’unanimité—ce qui en dit très long dans un monde où chacun tenait mordicus à ce qui, selon lui, faisait un beau jeu d’orgue. Né à Poitiers en 1870, Vierne était devenu presque aveugle suite à une cataracte congénitale et ce fut dans une institution pour élèves aveugles que César Franck le prit sous son aile. En 1890, année de la mort de Franck, il intégra la classe d’orgue de Widor au Conservatoire de Paris; il remporta son premier prix en 1894. Une large part du Quatuor révèle que, même à vingt-quatre ans, Vierne avait une approche spirituelle, à la manière de Franck—s’il avait assisté à la création du Quatuor de Debussy, en décembre 1893, cela ne se sent guère dans cette œuvre plutôt empreinte d’une économie de moyens à l’aune de son jeu organistique tout d’équilibre et d’aisance, sans geste fiorituré aucun, à en croire Duruflé. Ce que le Lento inaugural illustre bien: il dit ce qu’il a à dire via des entrées imitatives à la Bach et un chromatisme franckiste, mais condensés en sept petites mesures qui nous laissent sur notre faim. Dans l’Allegro agitato suivant, les deux thèmes principaux sont présentés avec clarté, le premier brusque, le second doux (comme il se doit) et avec une note longue au milieu de chaque phrase—une griffe franckiste. Après quoi le développement traite ces deux idées séquentiellement, avant de les entremêler. Notons également que la version renversée du premier thème renvoie à l’introduction lente. Il n’y a rien de particulier dans la réexposition, le second thème passant correctement de fa majeur au ré majeur de tonique; Vierne se contente de la plus brève des codas. L’Intermezzo est tout bonnement un des mouvements les plus délicieux de toute la musique de chambre française. Sur lui planent le «Scherzo de la reine Mab» de Berlioz et le Songe d’une nuit d’été de Mendelssohn, évoqués par des pizzicatos, des trémolos et des phrases dansantes qui changent brusquement de tonalité, en un rien d’espace. Difficile d’imaginer Vierne en train d’écrire cette page, comme il le fit pourtant, sur un immense papier à musique à l’aide, nous dit son ami Marcel Dupré, d’un «grand crayon». Là encore, il entend bien ne pas abuser de l’hospitalité de ses hôtes et la «conclusion» pourrait paraître de pure forme, n’étaient son harmonie et son sens du rythme, parfaitement jaugés. Le mouvement lent, de forme ternaire standard, exploite de nouveau la note longue franckiste en milieu de phrase, conférant au thème principal une langueur alors presque jamais entendue. Dans la section centrale, Vierne insuffle une certaine urgence via une figure de quatre rapides notes répétées partagée entre les quatre instruments. La première section revient comme il se doit et l’on croit d’abord s’acheminer vers une autre conclusion minimisée; mais Vierne nous réserve encore une surprise: une coda de dix-huit mesures par-dessus un la grave de tonique. Le tout ne dure peut-être que soixante-dix secondes mais, vu la fin relativement brutale des deux premiers mouvements, c’est un coup de maître. Le finale suit le modèle précédent, avec deux thèmes bien contrastés: l’un vif, tout en longueur, en doubles croches, l’autre, davantage lyrique, bâti autour de triolets et de la note longue centrale, toujours présente. Tout semble appeler une forme rondo standard, quand revient la fioriture inaugurale—et nous voilà avec une fugue. La pertinence de tout cela s’éclaire quand le contre-thème, la figure qui concorde avec le sujet, s’avère étroitement lié au premier thème, tout en longueur, du mouvement. Dès lors, et jusqu’à la fin, l’influence principale semble être celle de Mendelssohn, dans un mode plus académique que féerique (avouons que Vierne aurait pu choisir pire, comme influence). Enfin, en vertu des meilleures traditions, ré mineur se fait majeur et offre une conclusion vibrante à une œuvre qui, de bout en bout, affiche ce «rare naturel» qui, dans le jeu d’orgue de Vierne, impressionna tant Duruflé. Henri Constant Gabriel Pierné wurde 1863 im lothringischen Metz geboren. Sein Vater war Professor am Metzer Konservatorium und seine Mutter stammte aus dem südfranzösischen Montpellier (und einem seiner Biographen zufolge hatte Gabriel von ihr „eine gewisse Lebhaftigkeit“ geerbt). Seine Eltern fällten die kluge Entscheidung, Metz zu verlassen, um dem Deutsch-Französischen Krieg zu entkommen; die Familie zog nach Paris, wo der achtjährige Gabriel ab 1871 das Konservatorium besuchte und dort unter anderem von Massenet und César Franck unterrichtet wurde. Hier regnete es geradezu Erste Preise—in Klavier, Kontrapunkt und Orgel—, was 1882 im Prix de Rome gipfelte. Als Franck 1890 starb, übernahm Pierné bis 1898 seine Stelle als Organist an Sainte-Clotilde. Der entscheidende Posten war jedoch derjenige des Stellvertretenden Dirigenten des Colonne Orchester, den er 1903 annahm; nach dem Tod Édouard Colonnes im Jahr 1910 wurde er zum Chefdirigenten des Orchesters ernannt und behielt diese Stelle bis 1934. All dies trägt zu etwas bei, was vielleicht als eine „solide musikalische Karriere“ bezeichnet werden könnte, wobei impliziert wird, dass derart solide Musiker wahrscheinlich nicht besonders kreativ sind. In Piernés Fall zeigt sich eine Kontraindikation dessen in den Premieren, für die er engagiert wurde, wie etwa die des bereits genannten Feuervogels 1910 sowie eines Teils von Ravels Daphnis et Chloé 1911 und von Jeux 1913: bei all diesen Werken war gewiss Dirigiertechnik gefragt, aber auch eine gehörige Dosis an Lebhaftigkeit und Phantasie. Seine Kammermusik, die etwa ein Viertel seines Gesamtoeuvres ausmacht, gehört zwei bestimmten Phasen an: 1882–1900 und 1916–1936. Die erste endete mit seiner Violinsonate, die Jacques Thibaud gewidmet ist, mit dem er sie oft spielte. Die zweite Phase begann mit dem Klavierquintett in e-Moll, das am 22. Februar 1919 im Rahmen der Société nationale de Musique uraufgeführt wurde, wobei der Komponist selbst am Klavier saß. Dieses Werk ist Gabriel Fauré gewidmet. Im Allgemeinen ist der Doppeleinfluss von Massenet und Franck in Piernés Musik eine günstige Kombination—der Erstere trat mit Anmut und melodischer Ungezwungenheit hervor, während die kontrapunktischen Tendenzen des anderen für Substanz sorgten. Zu Beginn dieses Quintetts tritt jedoch weder der eine noch der andere in Erscheinung. Stattdessen antizipiert ein insistierendes, sich drehendes Vierton-Ostinato die 1920er Jahre, als derartige Ostinati sehr in Mode kamen, nicht zuletzt durch Strawinsky. Über dieser Repetitionsfigur schwebt ein kurioser jambischer Rhythmus, wodurch sich ein Verlustgefühl oder eine Nostalgie einzustellen scheint, ähnlich wie in Debussys Prélude Des pas sur la neige. Dieser Beginn ist jedenfalls nicht der „solide“ Anfang, den man von einem vierzigminütigen Kammermusikwerk erwarten würde. Plötzlich jedoch, vorangetrieben von gleichsam Franck’schen Klavierakkorden, hebt die Musik in einem Höhepunkt auf Streicher-Oktaven ab, bevor sie dann wieder abflaut. Das zentrale Thema ist in erster Linie auf Rhythmus aufgebaut, wobei punktierte Töne auf eine Triole folgen. Zumeist spielen alle fünf Instrumente, bis das Vierton-Ostinato zurückkehrt, dann die jambische Figur, bis die Musik schließlich zur Ruhe hinabsinkt. Pierné hatte bereits 1910 mit dem baskischen Tanz „Zortzico“ in seiner Bühnenmusik zu Pierre Lotis Stück Ramuntcho über baskische Schmuggler experimentiert (Piernés Dirigat der Ouvertüre ist auf YouTube zu hören und demonstriert seine straffe rhythmische Leitung). Der Tanz hat fünf Schläge pro Takt und punktierte Rhythmen (tam-tam-ti-tam-ti), und Ravel hatte in dem ersten Satz seines Klaviertrios von 1915 eine etwas abgeänderte Version davon verwendet (wobei noch drei Schläge hinten angefügt wurden). Pierné beginnt damit, dass er den 5/8-Takt des Zortzico mit einem standardmäßigen 4/8-Takt alterniert, als ob er seine Hörer behutsam an den Tanz heranführen wollte. Die Zortzico-Melodie stellt sich schließlich als reizvolle populäre Musik heraus; vielleicht handelt es sich sogar um eine ursprünglich baskische Melodie, obwohl sie bisher noch nicht identifiziert worden ist. Der Satz besteht zum größten Teil aus Variationen über diese Melodie in verschiedenen Tonarten und mit unterschiedlichen Harmonien, doch tritt auch eine zweite Idee in Form einer aufsteigenden Tonleiter hervor, die die abfallende Bewegung des Zortzicos ergänzt. Schließlich kombiniert Pierné die beiden in einem ungewöhnlichen 20/8-Takt, bevor die Musik in einem langen Des-Dur-Schleier wiederum zur Ruhe hinabsinkt. In der langsamen Einleitung zum Finalsatz lüftet Pierné ehrerbietig seinen Hut vor Franck, indem er sich auf Melodien und Rhythmen der beiden vorangegangenen Sätze zurückbezieht; dabei beginnt er mit dem Zortzico. Mit zunehmender kontrapunktischer Komplexität zieht auch das Tempo an, bis der Damm bricht oder, anders ausgedrückt, die Wolken sich verziehen und eine sonnige E-Dur-Melodie, Allegro vivo ed agitato, erklingt. Franck’sche Modulationen reißen alles mit sich und gipfeln in einem neuen Thema (das jedoch wiederum auf punktierten Rhythmen basiert), welches von trompetenartigen Akkorden des Klaviers begleitet wird. Ab hier befindet sich alles in Bewegung, wobei zwei relativ friedvolle Oasen für Abwechslung sorgen. Punktierte Rhythmen herrschen weiterhin vor, obwohl die Komplexität einen Höhepunkt erreicht, wenn der 5/8-Rhythmus des Zortzico mit sowohl einem 4/8- als auch einem 3/8-Rhythmus kombiniert wird. Die Jagd zum Ende hin ist belebend und triumphierend. Wenn das Dirigieren Piernés „Erfolgshindernis“ war, so war es für Vierne das Orgelspiel: 1900 wurde er im Alter von 29 Jahren durch einstimmigen Beschluss zum Organisten von Notre-Dame ernannt—in einer Sphäre, wo alle Betroffenen rigorose Ansichten bezüglich guten Orgelspiels vertraten, sprach diese Wahl Bände. Vierne wurde 1870 in Poitiers geboren und war aufgrund angeborener Katarakte fast blind. In einer Lehranstalt für blinde Schüler begegnete er César Franck, der ihn unter seine Fittiche nahm. In Francks Todesjahr, 1890, kam er in die Orgelklasse von Widor am Pariser Konservatorium und gewann 1894 seinen ersten Preis. Ein großer Teil des Quartetts offenbart, dass Viernes Ansatz selbst im Alter von nur 24 Jahren bereits ein spiritueller im Stile Francks war—wenn Vierne im Dezember 1893 die Uraufführung des Quartetts von Debussy gehört hatte, so finden sich hier kaum Hinweise darauf. Stattdessen wird eine Ökonomie des Ausdrucks deutlich, die sich auch in seinem Orgelspiel manifestierte: Duruflé zufolge war es für seine Ausgewogenheit und Leichtigkeit bemerkenswert; blumige Gesten fanden hier keine Verwendung. Das Lento zu Beginn ist ein gutes Beispiel dafür—es erklingen hier imitative Einsätze à la Bach sowie eine Franck’sche Chromatik, jedoch sind diese auf lediglich sieben Takte verdichtet, so dass man sich als Hörer noch mehr wünscht. Im folgenden Allegro agitato werden die beiden Hauptthemen deutlich vorgestellt, das erste ist abrupt, das zweite geschmeidig (in der bewährten Weise) gehalten, wobei jeweils in der Mitte der beiden Phrasen ein langer Ton erklingt—ein akustischer Fingerabdruck seines Lehrers Franck. Danach werden in der Durchführung beide Ideen sequenzartig behandelt und dann miteinander kombiniert. Ebenfalls zu beachten ist, dass die umgekehrte Version des ersten Themas sich auf die langsame Einleitung zurückbezieht. In der Reprise finden sich keinerlei Kunstgriffe, das zweite Thema bewegt sich nun korrekt von F-Dur zur Tonika D-Dur und Vierne begnügt sich mit einer knappen Coda. Das Intermezzo ist schlicht und ergreifend einer der köstlichsten Sätze der französischen Kammermusik überhaupt. Darüber schwebt der Geist des „Queen Mab Scherzos“ von Berlioz und des Sommernachtstraums von Mendelssohn, der mit Pizzicati, Tremoli und tänzerischen Phrasen, die plötzlich auf dem Absatz kehrt machen und von einer Tonart in die nächste hüpfen, hervorgezaubert wird. Man kann sich kaum vorstellen, wie Vierne diese Musik notierte, was er auf riesigen Notenpapierbögen und mit, wie wir von seinem Freund Marcel Dupré wissen, „einem großen Bleistift“ tat. Auch hier ist er dazu entschlossen, nicht länger zu bleiben, als er willkommen ist, und der „Abschied“ könnte routinemäßig klingen, wäre er nicht so gewissenhaft und gekonnt konstruiert, was sowohl die Harmonie als auch das Timing angeht. Der langsame Satz steht in standardmäßiger dreiteiliger Form und macht sich ebenfalls den langen Franck’schen Ton in der Mitte der Phrase zunutze, was dem Hauptthema eine Sehnsucht verleiht, die wir hier fast zum ersten Mal hören. Im Mittelteil sorgt Vierne mit einer Figur von vier schnell wiederholten Tönen, die in allen vier Instrumenten erklingt, für eine gewisse Dringlichkeit. Der erste Teil wird dann ordnungsgemäß wiederholt und zunächst hat es den Anschein, als ob ein weiteres heruntergespieltes Ende in Aussicht stünde, doch wartet Vierne dann mit einer Überraschung in Form von einer 18-taktigen Coda auf, die vollständig über dem tiefen Grundton A erklingt. Zwar mag sie eine Dauer von nur 70 Sekunden haben, doch ist diese Coda im Kontext der relativ abrupten Abschlüsse der beiden vorangehenden Sätze geradezu ein Geniestreich. Das Finale ist gemäß der vorherigen Anlage konstruiert; es hat zwei gegensätzliche Themen, ein lebhaftes, sehniges in Sechzehnteln und ein eher lyrisches, das um Triolen und den stets präsenten langen zentralen Ton herum gebaut ist. Alles scheint sich auf ein reguläres Rondo hinzubewegen, doch dann kehrt die Anfangsgeste zurück und dem Zuhörer wird eine Fuge präsentiert. Die Relevanz dessen wird klar, wenn das Kontrasubjekt sich als eng verwandt mit dem sehnigen ersten Thema des Satzes herausstellt. Von dieser Stelle bis zum Ende scheint der wichtigste Einfluss kein Geringerer als Mendelssohn zu sein, und zwar nicht so sehr in Elfenstimmung, sondern eher in akademischer Manier. Schließlich wird nach bester Tradition d-Moll zu D-Dur, wodurch für einen mitreißenden Abschluss eines Werks gesorgt wird, das durchweg „die ungewöhnliche Natürlichkeit“ aufweist, die Duruflé an Viernes Orgelspiel so beeindruckte.